The ESV Study Bible was created to help people understand the Bible in a deeper way. Combining the best and most recent evangelical Christian scholarship with the highly regarded ESV text, it is the most comprehensive study Bible ever published. 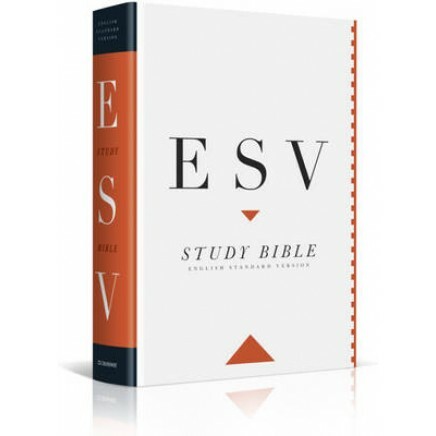 The ESV Study Bible features more than 2,750 pages of extensive, accessible Bible resources, including completely new notes, full-color maps, illustrations, charts, timelines, and articles created by an outstanding team of 93 evangelical Christian scholars and teachers. In addition to the 757,000 words of the ESV Bible itself, the notes and resources of the ESV Study Bible comprise an additional 1.1 million words of insightful explanation and teaching, equivalent to a 20-volume Bible resource library all contained in one volume. Size: 6 1/2" x 9 1/4", 2,752 pages, Single-column Bible text (9-point type), double-column notes (7-point type), Black letter text, Finest quality European Bible paper, Durable Smyth-sewn bindings on all editions.